Marty WalshThe Dorchester Reporter endorses Marty Walsh for Mayor. Few observers will be surprised by this newspaper’s decision to come out for the hometown favorite. But the decision is not as simple as one might think. The Reporter did not endorse any candidate in the preliminary election because, for one thing, there were six Dorchester residents on the ballot. In our estimation, four of them – Walsh, Charlotte Golar Richie, John Barros, and Bill Walczak – each made a compelling case for election. Now that it’s a head-to-head match-up between Walsh and City Councillor John Connolly, the choice from this vantage point is less complex. But, that’s not to say that Connolly doesn’t warrant our consideration. The 40-year-old West Roxbury resident has been a solid city councillor. He has been laser-focused on school-related issues during the last few years. He has a strong and committed staff. And he himself is a vital, energetic politician who clearly could be an effective mayor. Boston would be well served by both men. But we believe Marty Walsh is the better choice because his personal background and career track have positioned him to be a more immediate agent of change in a city that needs it desperately, especially here in Dorchester and Mattapan. Walsh has the potential to be a transformative leader for Boston on multiple fronts, but especially when it comes to job equity and neighborhood development. His opponents assert that his union ties will handcuff him in contract negotiations. But, we think Walsh can – and must – show and prove a level of independence and pro-active dealmaking with city unions that will actually be more progressive than the alternative presented by his opponent. He is popular not just with union leaders, but with rank-and-file members. It’s an unprecedented dynamic and one that could prove fleeting once he begins making substantive, potentially unpopular fixes. But for those interested in moving beyond the sort of prolonged stalemates that typify municipal contract talks – and larger reform measures – it is tantalizing to envision what Walsh could do in this arena in a first term. A Mayor Walsh will also be better positioned to transform Boston’s workforce – not just in city-controlled jobs, but across the trades as well. He showed foresight by launching a pilot effort to create a better pipeline for minority and women workers to enter the trade unions that he has led. That program must be enhanced ten-fold to make a real dent in the long-standing color barrier that persists in this town when it comes to jobs, particularly in the construction trades. The transition must take place well beyond the apprentice level and extend to the very top of the leadership at individual unions – a challenge that will demand a strong executive push from the next mayor. It is difficult to imagine a voice from outside the trade unions making this case more effectively than Walsh. 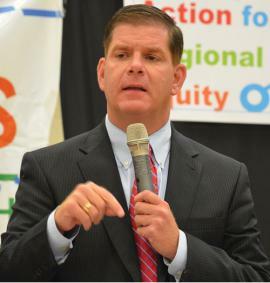 Walsh is also in a better position than any leader in the city to actually gain ground for minority and women workers. It’s one of the reasons why he has attracted such sweeping support from leaders in the city’s communities of color. They understand that a Mayor Walsh – with their input – can make City Hall a more diverse and inclusive environment. But he will also use his influence beyond Government Center to insist upon diverse hires in boardrooms and union halls that other political leaders have little or no control over. Walsh’s success in bringing former mayoral rivals into his camp since the Sept. 24 preliminary has been revealing. So, too, has his ability to win the support of key leaders of color, the latest being Mel King, the pioneering 1983 mayoral finalist who endorsed Walsh on Tuesday. Walsh has amassed an impressive lineup of supporters who represent both the new and old guard of the city’s leadership within communities of color. Marty’s big tent – already populated with talented, progressive veterans of campaigns for the president, governor and Elizabeth Warren – has continued to swell since September. That speaks volumes about his leadership and personal style and it bodes well for a Walsh administration. These leaders see in Walsh much of what we see: the promise of a transformative and collaborative mayoralty that will open up new frontiers for traditionally underserved Bostonians of all colors and creeds. He is a sensitive and compassionate leader who has shown backbone when it has counted on matters of civil rights and for working people. He’s a good listener and a coalition-builder who has quietly helped other people – powerful or not – in ways large and small throughout his career. On those occasions throughout the years when we’ve disagreed with Walsh – and done so publicly –his response has been measured and professional. He doesn’t shut off critics. He seeks to engage them, win them over, or find a compromise position. He doesn’t shy away from a fight, but he doesn’t seek to prolong one either. It’s a style that makes him a good fit for the job he has – and the one he seeks. City government needs a leader at its helm who has an authentic feel for our neighborhoods and who understands at a gut level the pressures of the daily grind that most city residents face. Boston will have that mayor in Marty Walsh. He has our vote on Tuesday.